None generally needed, because mustard is customarily used as a late summer/autumn cover crop to take up nitrogen left in the soil by sweet corn or other vegetables. 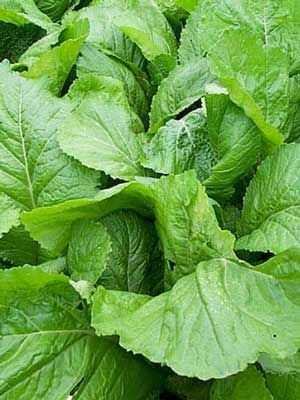 Sow in late summer to use mustard as a short-term autumn green manure. Broadcast seed into cultivated soil so that the seeds are about 5 cm (2in) apart and 1 cm (1/2 in) deep. Thin to 15 cm (6in) apart in all directions. You can gather individual leaves for cooking, which taste best after the first frost has passed. Mustard residue suppresses soil-borne nematodes, so it is an excellent green manure to grow before potatoes. Irrigation is often needed to get a good stand if autumn is dry.